David Krut Projects (DKP) is pleased to present a selection of richly layered paintings by Ethiopian artist Endale Desalegn. For his first solo exhibition with David Krut Projects NYC, Endale interrogates ways in which capitalist structures mediate human dependencies on material objects – a relationship which he experiences to be fast spreading from the West into Ethiopian society. 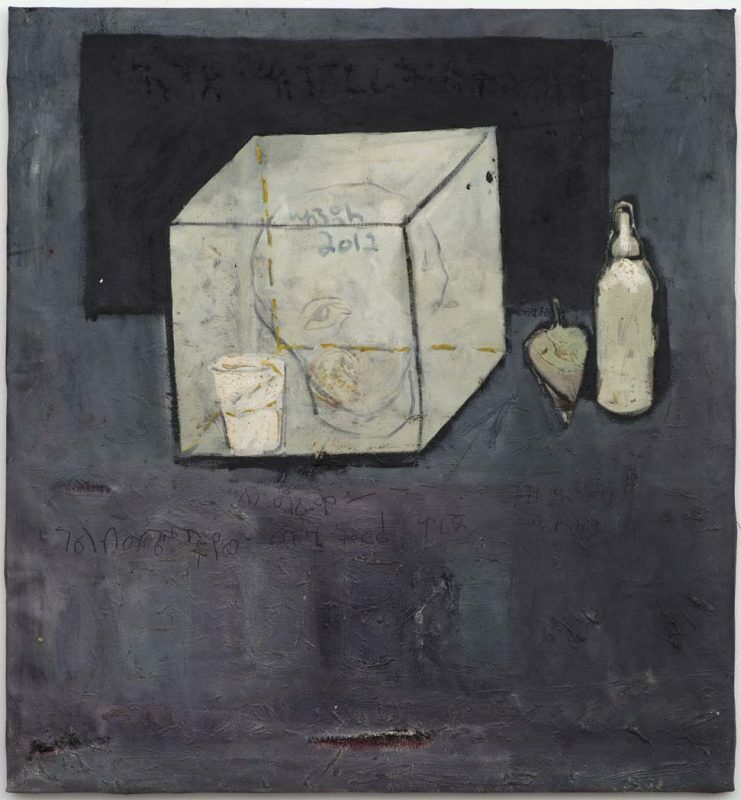 For Endale, who was born under the Derg – a Soviet-influenced communist period in recent Ethiopian history – “it is striking that the hammer and sickle universally represent communism, yet there is no one recognizable symbol for capitalism.” In this evocative body of work, the artist takes symbolic visual tropes, such as a baby’s milk bottle and a pacifier, to explore capitalist imagery and, in this vein, to draw connections between natural and constructed systems of dependence. Whereas the milk bottle represents the adult’s relationship to an ATM, the pacifier evokes methods of compensation used to sooth insatiable human desire, which is both enflamed and restrained under a capitalist system. Endale’s astute visual commentary is heightened by the fact that his home city, Addis Ababa, is becoming more consumerist-driven by the day. Gentrification is enacted in the name of urban development and has come with a heavy price for families like Endale’s for whom the city has become increasingly inaccessible to the extent that they are facing possible eviction from their home. This compelling exhibition is packed with subtle visual references to social survival and seeks to provoke contemplation on this unpredictable mode of existence. Recurring symbols, pertaining to measurement methods and roughly sketched allusions to the figurative, come together to convey a profound sense of uncertainty around the modern self. Endale’s exhibition therefore invites viewers to consider this global context where consumerism has become intrinsically bound up with concepts of agency and identity. Light and darkness is also a dominant theme, for which the artist uses a monochrome palette to explore a widely shared state of being in Africa where access to electricity is not a given. Endale takes a metaphorical approach, perceiving that in the darkness the world takes on a sharper tactility which can be accessed through gaining a spiritual sense of one’s surroundings. Endale’s paintings are peppered with religious symbolism, such as circular stigmata, to reflect on his observation that in contemporary Ethiopia, religion is losing its grip on modern culture and giving way to capitalist ideologies. Endale has exhibited in Ethiopia, South Africa, Portugal and the United States. Most recently, he exhibited at David Krut Projects in Johannesburg in a solo show titled Two Social Pacifiers (2015), following from a successful solo exhibition, A Single Vibration (2014), also at DKP. Endale has had artist residencies in Lisbon (2011) and David Krut Projects, Johannesburg, (2014, 2015) and has lectured at Addis Ababa University’s Institute of Architecture (2009) and at Hawassa College of Teacher Education in Ethiopia (2013). View Endale Desalegn’s solo exhibition on Artsy.